Nikolay Davydenko will play in the Rogers Cup tennis tournament this week amid an investigation into irregular gambling patterns on one of his matches. The ATP said Monday it had no plans to suspend the Russian or ask him to sit out. "It is important that we not jump to conclusions, especially when players' reputations could be unfairly tainted," ATP executive chairman Etienne de Villiers said. "What we must do is carry out a comprehensive and immediate investigation and that is what we are doing." 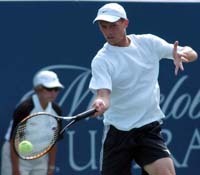 Davydenko is seeded fourth at the Rogers Cup and won't play until the second round on Wednesday. The ATP is looking into Davydenko's match against Martin Vassallo Arguello at the Prokom Open in Sopot last week. In an unprecedented move, British online gambling company Betfair voided all bets on the match when it drew about $7 million (EUR 5 million) in wagers, about 10 times the usual amount for a similar match. Most of the money was on Arguello to win, even after Davydenko won the first set 6-2. Arguello won the second set 6-3 and was leading 2-1 in the third when the Russian retired. The bookmaker has an agreement with the ATP to report any irregular betting. "With regards to the recent match involving Nikolay Davydenko and Martin Vassallo Arguello, we have instigated a full ATP investigation and we will be using all means available to us - including independent, external resources - via our anti-corruption rules to conduct a complete and thorough investigation," de Villiers said.